This is a first try at a semi-automated tracker for 990s for all organizations. There is more work to be done. Some EINs need to be updated; some special cases, such as organizations which maintain a single set of books for both alumni and undergrads, need to be identified. Eventually this might be able to send automatic email reminders. The data is extracted from the IRS Exempt Organizations Master File and the IRS Automatic Revocation of Exemption List as of the dates appearing below. It can take 45-60 days after submission of a Form 990 before the IRS Master File is updated. Note - a few organizations are shown as 501(c)(2) in the IRS masterfile. Any 501(c)(2) must have a parent - the actual alumni corporation, which must be exempt itself, typically as a 501(c)(7). It is possible that the EIN which has been submitted by the the parent alumni corporation is not its own, but rather the EIN of its subsidiary 501(c)(2) title-holding corp. This title-holding corp must turn over all its earnings less expenses to its parent, and both the parent and the title-holding corp must file separate 990s. I also note that one of our organizations is classified as a 501(c)(8). For this classification to be valid, the organization would have to operate as a parent organization with subsidiary lodges. How an organization operates determines what it is, not something in an incorrect database. Any misclassified organizations should most likely indicate 501(c)(7) on their 990, regardless of what is in the database. 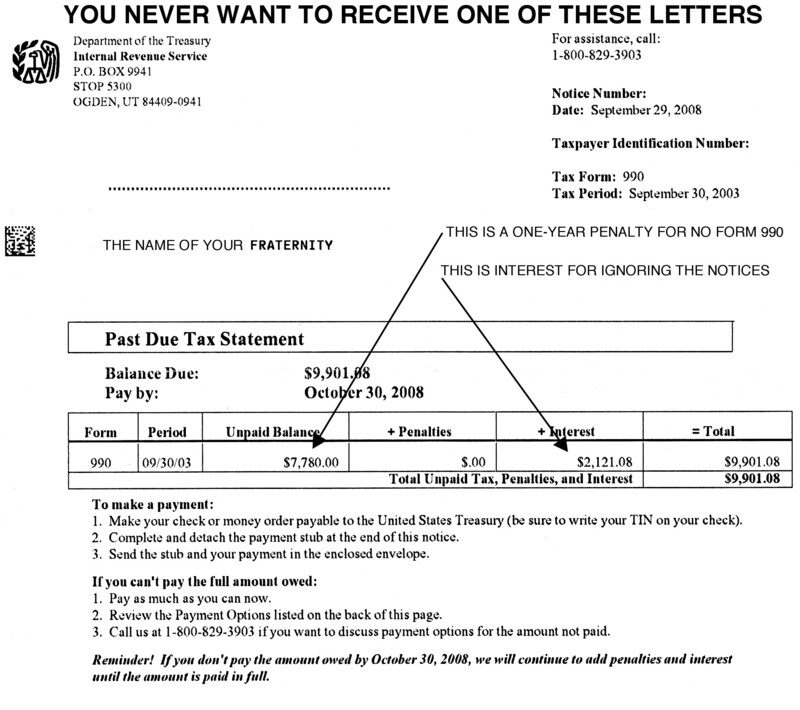 Unlike public charities (501(c)(3) organizations), social clubs (501(c)(7) organizations) are not required to obtain a determination letter, although either applying for and obtaining a determination letter, or having your EIN listed in your national organization's group exemption, is recommended. For information about group exemptions (which are not the same as group filings), see the "Letters of Determination, Group Rulings, and EINs" section of the group filings page, and the links to IRS resources located there. No IRS record found The EIN is not in the IRS masterfile. This may not indicate a problem if the organization files under a different EIN or if the alumni and undergraduates are a single organization and file together. This should be clarified, see below. Combined Your accountant tells you that both the alumni and undergraduates are a single organization (which may or may not be a good idea from a legal standpoint), and you file a single 990 with the alumnus treasurer responsible for the finances of the entire organization. Black Due Date Filing is up to date, and your current fiscal year is not yet over. Green Due Date Filing is up to date, but your fiscal year has ended and a new 990 will be due soon. Blue Due Date It is past the filing date but may be too soon for the IRS Masterfile to have been updated. Blue "Check Group" The IRS record indicates that you have never filed, but that you might have been included in a group filing. Please see "Group 990 Filings" for more information, or see "Combined" filings above. Orange Due Date It is more than four months past the due date. This is a problem unless you have filed for an extension. Red Due Date It is more than seven months past the due date, and beyond the time for which any extension is valid. Red "Exempt status revoked" The IRS has revoked your exempt status for failure to file for three years. You may also be about to receive a notice of fines due, like this one. If you have begun filing a single combined return, you may not actually have a problem. and IRS Exempt Status Revocation Data posted 09 Apr 2018. Note: Undergrads in National Group Filing as of 2011. Previously filed under their own EIN. Note: BTP Alums file as for-profit corporation. Note: Undergrads in National Group Filing as of 2013. Previously filed under their own EIN. Exempt status restored 1-Jan-2016 after revocation. Note: Undergrads in Group Return. Previously filed under their own EIN. Note: Combined filing. Has been discussed with tax advisors. failure to file for three years. Note: PDT cannot find alleged private letter ruling allowing combined filing. Note: Alumnae in National Housing Corp Group Return.